Another picture by Sam Supowit! So glad he was there to photograph our Mijana's showcase! Lest you start to think this blog is going to be all opinions, all the time, here's a lighter-hearted post about my NEW COSTUME! 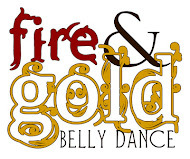 In order to match better with Skirt Full of Fire, Fire & Gold now has a pretty black sparkly costume set. To make this, I had to learn how to make a belt, which was surprisingly not awful. You can't really see it in this picture, but that's OK. It needs more embellishments before it's done! The bra probably needs a little more, too... a belly dangle and I'm thinking Swarovski sequins for sure! For my set I chose some fabric I already had, a beautiful black-on-black embroidered taffeta-y cloth. I added some pre-made appliques with a kind of Art Nouveau floral style to them, because that's totally what I'm in to right now and they look good with my tattoo. The bra has drapes of gunmetal chain. The belt will too, eventually, but I might need to pick up more chain at the gem show next week. Oh, and there's a vintage faceted black glass button at the center of the bra, because I have to justify my collection of glass buttons by using them occasionally. I like this costume because each member of F&G has a little something different, but because they're all black and sparkly we look great together! Plus we have palazzo pants and a hip scarf as our bottom half, which is sooooo much less bulky than pantaloons and a 25 yard skirt and a hip scarf! It makes for a very sharp tribal fusion look.